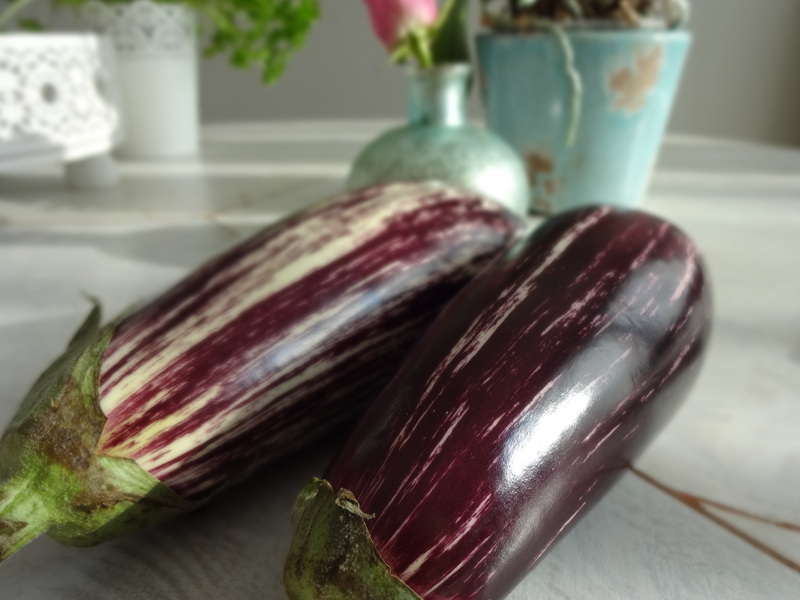 When I was strolling over the local farmer’s market last Saturday, I immediately eyed the beautiful striped eggplants. I mean just look at them. I think they really belong to the most beautiful vegetables out there. They were almost too pretty to eat them! I had some sweet potatoes left and amaranth from a granola recipe testing, so I decided to stuff these beauties with both the sweet potatoes and the amaranth. Since I am a big fan of sauces and creams, I added an avocado sauce which made the outcome amazing. All you need for this recipe is amaranth, which is a gluten-free grain alternative also known as a “power grain”. It is widely known among athlets because it is commonly found in engery or protein bars. Amaranth is packed with protein, amino acids such as lysin which is important for healthy skin and bones, and minerals such as calcium, magnesium or iron. It is pretty great to add to your diet. 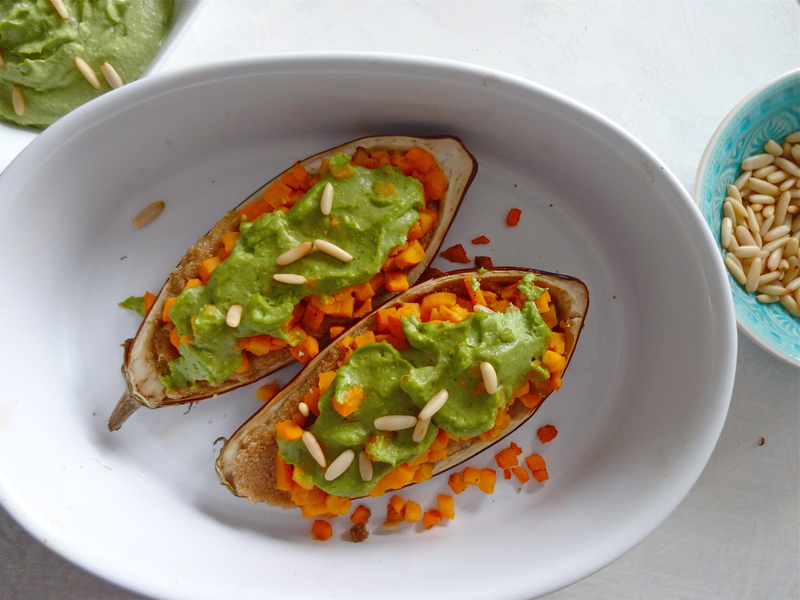 In combination with the sweet potatoes and the avocado basil pesto, it is a real power dish that I am sure you will love. Preheat the oven to 200 degrees celcius (390°F). 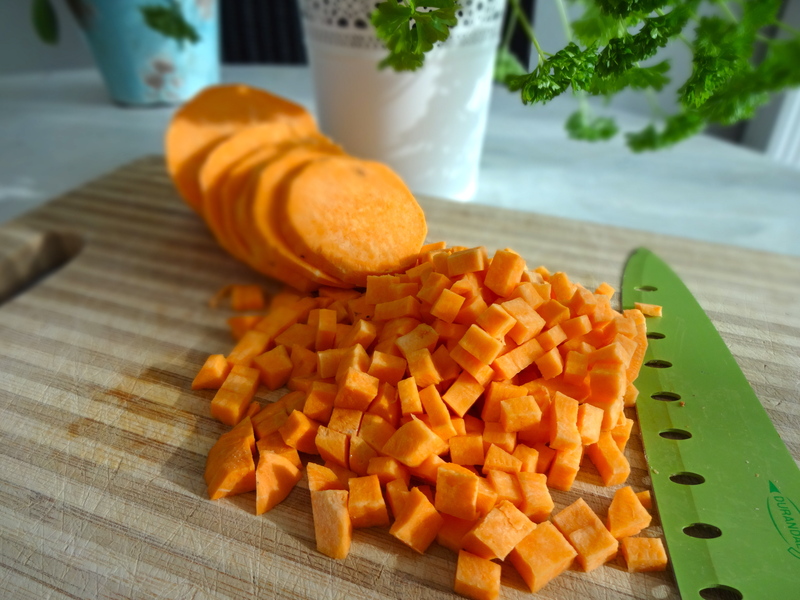 Then peel and cut the sweet potatoes into little cubes. Add them to a bowl with 1 tbsp of the olive oil, cumin, cinnamon, coriander and salt and mix well until the potatoes are completely coated. Place them on a baking sheet and bake for about 20 minutes. In the meantime prepare the amaranth. Add the grains to a medium saucepan filled with the water and the apple cider vinegar. Bring to a boil, then reduce the heat and let it simmer for about 20 minutes. Take off the stove and let it stand for another 20 minutes. Now take the sweet potatoes out of the oven and add them to the amaranth. 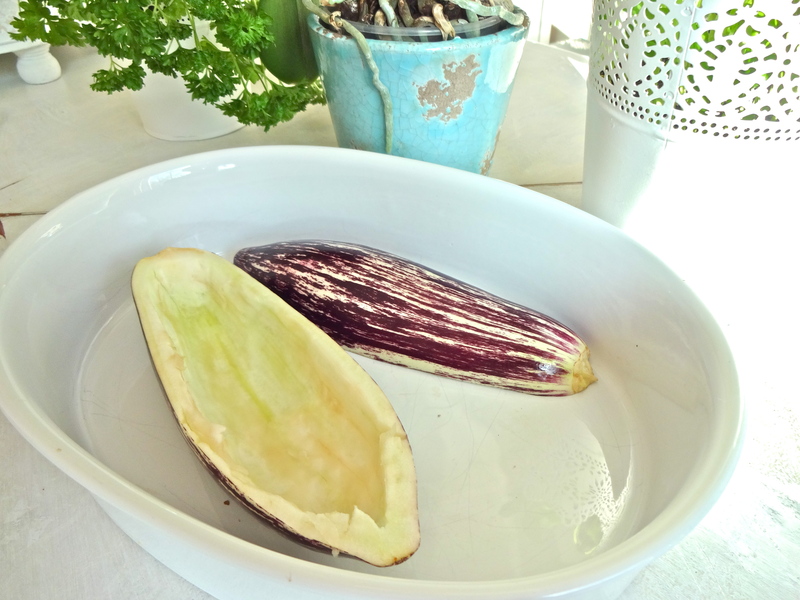 Next, half the eggplants and take out the inner flesh with a spoon. Place the halves into one large or two medium baking sheets and bake for about 10 minutes. Simply take out the avocado flesh with a spoon and add it to a blender together with all the other ingredients. Blend until smooth and creamy. If your blender is not strong enough, add some water to make it blend easier. Next, take the eggplants out, grease them with the remaining olive oil, then back into the oven for another 5 minutes. Take them out again, and fill their bottom with the sweet potato amaranth mix. Spread the avocado basil pesto on top and bake for another 5 minutes until everything is nicely soft and warm. Sprinkle with some more pine nuts and enjoy!